Summon your wind-up Shantotto minion. But remember: If you fail to treat her right, she will set your pants alight. 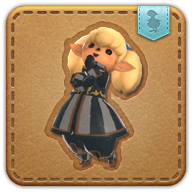 If it looks like a Lalafell, rhymes like a Lalafell, and alliterates like a Lalafell, then it is probably a Lalafell...except when it is a wind-up Shantotto. Then it is not a Lalafell.